Best (Elephant) Friends Forever! Do elephants need besties? Many elephants in zoos show warning signs that cause managers and scientists to be concerned about their welfare. Among these signs are the expression of abnormal, repetitive behavior (called “stereotypic behavior”), poor reproductive success, and high levels of obesity1,2. 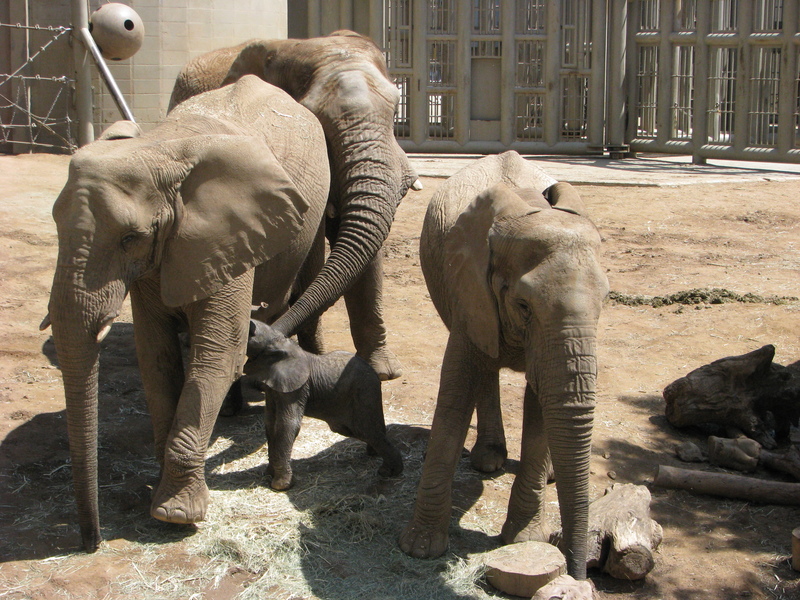 Could these issues be related to the social environments that zoo elephants experience? Elephants are extremely social animals. In the wild, they live in stable family herds ranging from 5-10 individuals. Herds typically consist of an older matriarch, and her adult daughters and their offspring. Females will usually stay in these herds for their entire lives, while males will disperse once they reach adolescence and live alone or join other small groups of males3,4. Elephants are described as developing strong bonds with their herd mates; They show high levels of positive interactions, distress from unexpected separation of herd mates, assistance to fallen or injured herd mates, care of other herd mates’ calves (called “allomothering”), and defensive group action against perceived threats. Additionally, both Asian and African elephant family herds develop extensive social networks and can communicate and interact with dozens of other elephants4-7. Typical wild African elephant family herd at a watering hole. Photograph by James Tyrrell. In many North American zoos, elephants are often housed in small groups (2-3 elephants) of unrelated, adult females. Small-scale studies indicate that zoo elephants do engage in typical elephant social behaviors8,9. Below is a video of zoo elephants rushing to the aid of a fallen calf, similar to what has been observed in wild elephant herds. In another study, it was shown that some zoo elephants will spend significantly more time interacting with and spending time near certain herd mates than with others. Additionally, some elephants show distress when separated from certain but not all herd mates10. These studies suggest that zoo elephants have the capacity to develop unique, strong positive relationships with herd mates but do not always do so. Unfortunately, these studies are limited in the number of elephants studied and/or the depth of their assessments. Additionally, as with most scientific pursuits, these studies prompt us to ask even more questions – How can we accurately assess zoo elephant relationships? What factors influence the strength of elephant relationships or whether or not elephants will develop a relationship at all? How are these relationships related to elephant welfare? These are the exciting questions my research is trying to answer! You might be thinking, “How can having friends make an animal healthy or happy?” This may happen through multiple ways including learning important species-specific behaviors, mental and physical stimulation or enrichment, and stress buffering. That’s right – in some animals, including some primates, the presence of a friend can help decrease stress responses11, although this is yet to be confirmed in elephants. The Association of Zoos and Aquariums, which the majority of U.S. zoos are accredited by, now states that accredited zoos must house a minimum of 3 elephants12. However, the next step is to see whether and how social relationships (not just total herd size or time spent in the same enclosures with other herd mates) are related to various welfare indicators in elephants. So, do zoo elephants need BFFs? It appears likely, but stay tuned to find out if so and what zoos can do to help promote elephant BFFs! Zoo African elephants interacting. Photograph by Brian Greco. Harris, M., Sherwin, C., Harris, S. 2008. The welfare, housing, and husbandry of elephants in UK zoos. http://randd.defra.gov.uk/Default.aspx?Menu=Menu&Module=More&Location=None&ProjectID=13192&FromSearch=Y&Publisher=1&SearchText=wc05007&SortString=ProjectCode&SortOrder=Asc&Paging=10: Department for Environment Food and Rural Affairs. Mason, G.J., Veasey, J.S. 2010. What do population-level welfare indices suggest about the well-being of zoo elephants? Zoo Biology. 29:256-273. Moss, C. 1988. Elephant memories. Chicago: University of Chicago Press. Sukumar, R. 1989. The Asian Elephant: Ecology and Management. Cambridge: Cambridge University Press. Douglas-Hamilton, I., Douglas-Hamilton, O. 1975. Among the elephants. New York: The Viking Press. Moss, C.J., Croze, H., Lee, P.C. 2011. The Amboseli Elephants: A Long-Term Perspective on a Long-Lived Mammal. Chicago: University of Chicago Press. Adams, J. and Berg, J.K. 1980. Behavior of female African elephants (Loxodonta africana) in captivity. Applied Animal Ethology. 6:257-276. Garai, M.E. 1992. Special Relationships between Female Asian Elephants (Elephas maximus) in Zoological Gardens. Ethology. 90:187-205. Rault, J. Friends with benefits: Social support and its relevance for farm animal welfare. Applied Animal Behaviour Science. 136:1-14. Association of Zoos & Aquariums. AZA Standards for Elephant Management and Care. March 2011. 1-35.